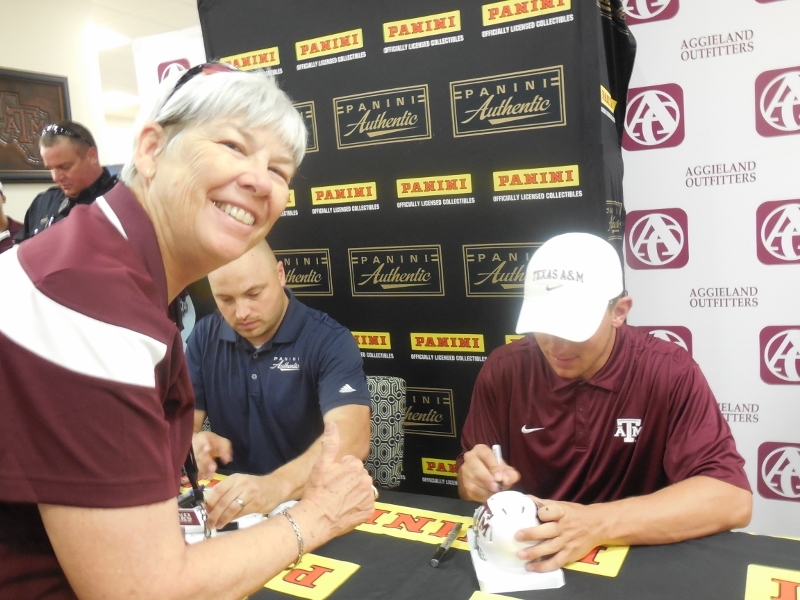 Yes, I stood in line for almost two hours to get Johnny Manziel’s signature yesterday, Sunday, July 12, 2015. 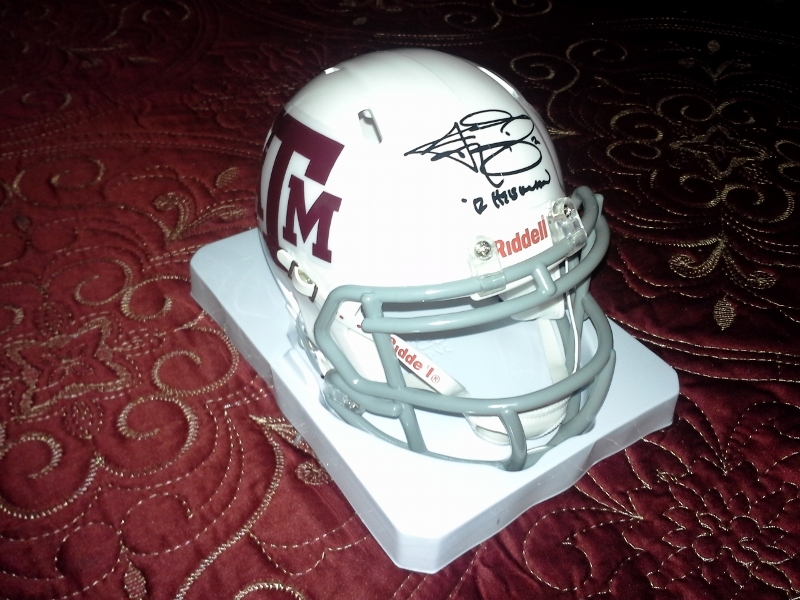 I chose the white mini-helmet to have Johnny Manziel sign. 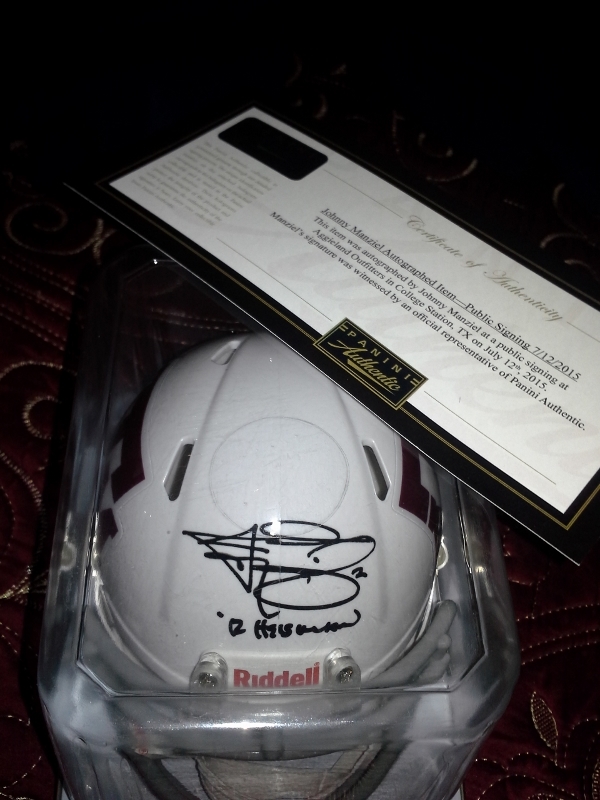 The particulars of how I was able to obtain a ticket to the event, why I chose to obtain it and how much money I spent to obtain his signature plus the inscription of “Heisman 12” are another story. Today is the backstory of why I chose the white mini-helmet. Date: Wednesday, July 2, 2015 – Confirmation of being a ticket holder for event on July 12. Eventually only 350 tickets were sold. Each item you wanted him to autograph required a ticket. Large ticket items (full size helmets, footballs, posters) were $150. 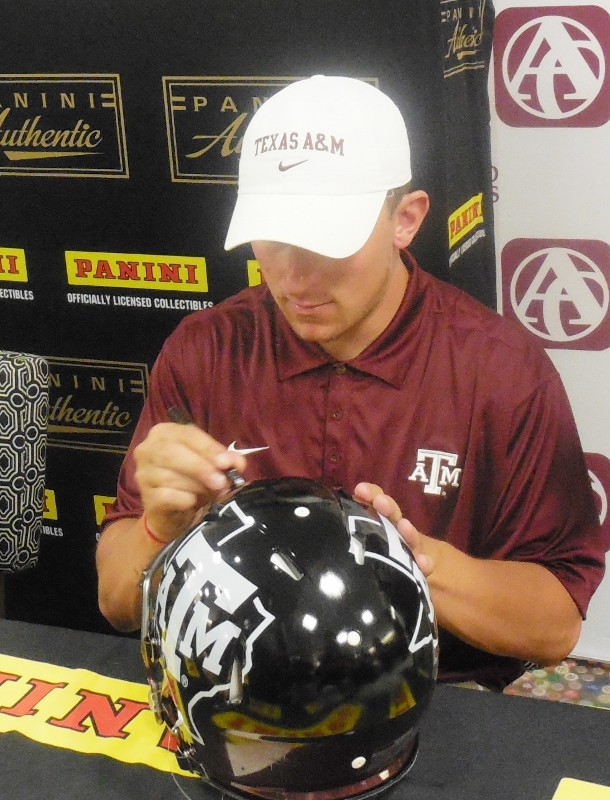 Need: Something for Johnny Manziel to sign on the Johnny Manziel Resurrection Tour. Me: I cannot decide which mini- helmet I want him to sign. 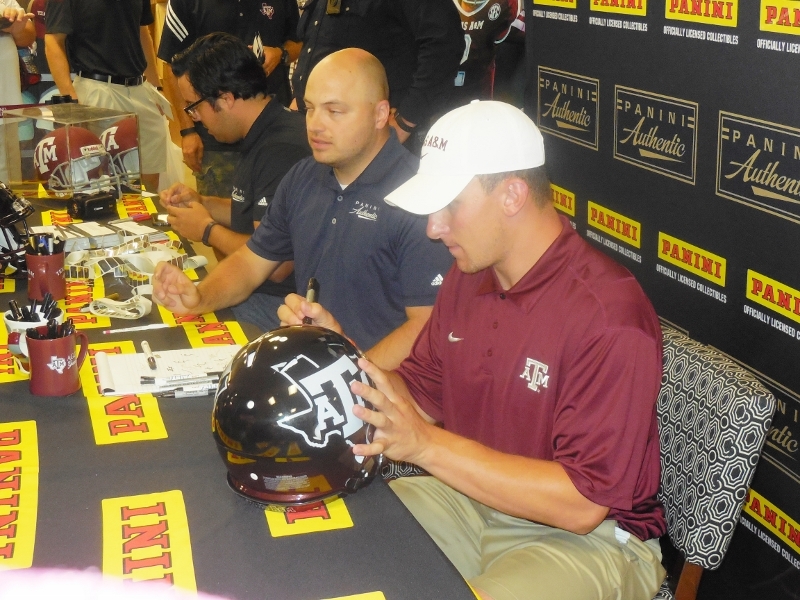 I think I will go with the white one because that was the one The Aggies wore when we defeated Alabama in 2012. Clerk: Oh no. That was an away game, so it would have been the black one! Me: Thoughts to self – Did you just tell me I was wrong? I am older, have more insurance and confident enough to bet any sheepskin on my wall that I am smarter than you. And I will forget more about Aggie football than you will ever know. I know where I was and who I was taking to on the phone (Ms. Navasota, T. McE) as the clock ran out (read: witness) when score was Texas A&M 29 and Alabama 23 in Tuscaloosa in 2012. Me: I will take the white one. A couple of shots. Gig ‘Em. 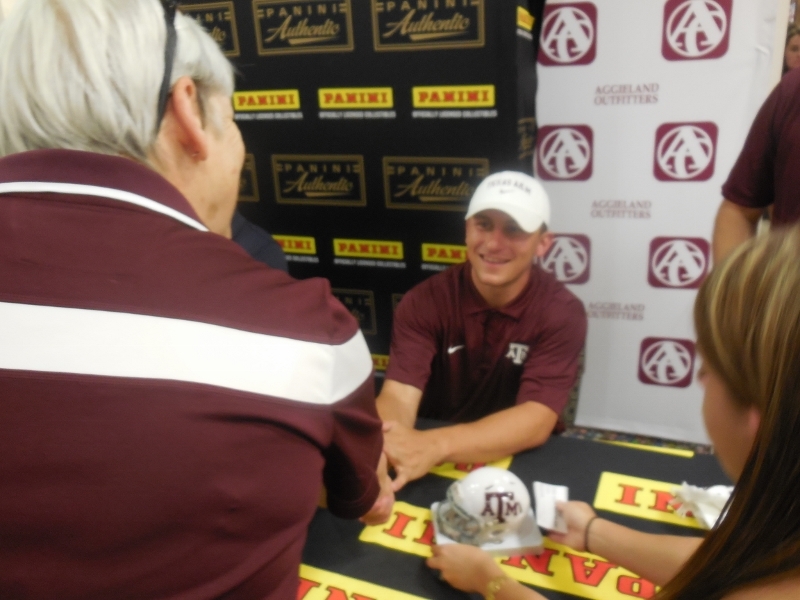 This entry was posted in Uncategorized and tagged Aggieland Outfitters, Heisman Trophy 2012, Johnny Manziel, Texas Aggies; football. Bookmark the permalink.